Vientiane airport’s expansion project is progressing as scheduled with officials saying it should be completed by early 2018. So far, construction teams have completed 11% of the work. Vientiane Times quoted the project update released by the Embassy of Japan to Laos and the Japan International Cooperation Agency (JICA). Supported by a concessional loan of approximately 9 billion Japanese yen the project will expand passenger service facilities to deal with increasing demand. 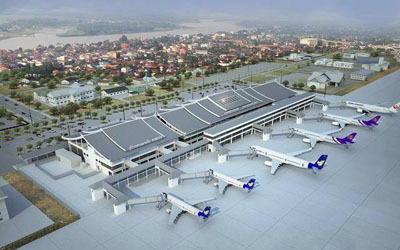 Passengers to the Lao capital are likely to reach 2 million people by 2023. Expansion work began in December 2015 under the supervision of the Ministry of Public Works and Transport. Critics say achieving an 11% completion rate in slightly more than one year suggests finishing the remaining 89% of the project will be a challenge if the contractor is to meet the “early 2018” deadline. However, the 11% includes time-consuming heavy duty construction on foundations and pilings. The Department of Civil Aviation and the Ministry of Public Works and Transport, have pledged to open the facilities at the beginning of 2018. It involves renovating a deteriorated domestic terminal that was constructed 50 years ago. Its passenger service were relocated to a temporary terminal that was opened in October 2016, while work was underway.